) Body Pattern: Using high-grade laser drawing foil and painting to create attraction to the predator fish. 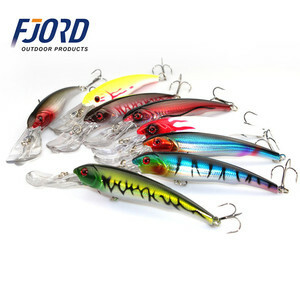 , Ltd, while Weihai JE has been engaging in design and manufacturing of deep sea fishing lures for more than 10 years. 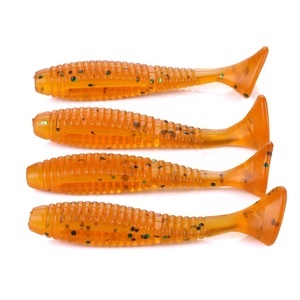 The major products cover high-quality wooden popper, wooden stickbait and metallic jigging lures, etc. 1.The fishing lures are created life-like swimming actions in water. 2.Bright colors,easy to find fish in the water. Q2: If I want to buy more, is there any discount available for china fishing shop fishing gear fishing grip 9 A: Yes, more quantity, more discount, if for small quantity, you can buy directly online, but if for mass order, pls send inquiey or contact us via TM online. OEM Service If you don't find something you like, tell us your idea and your design and let's turm them into the real lures. 1) Customized designs 2) Customized colors 3) Customized branding / logo / package As ideas come up to you, we make them into reality. DHL, takes 5-7 work days (most countries) EMS, takes 7-9 work days (most countries) China Post Air Mail , takes over 30 days. Logo can be printed on lure 's chin,and other position . Barcode can be printed by us , but if large quantity ,we need charge . 5: Can you make lure mold for me 9 like jig head ,metal lure 9 or topwater lure 9 Yes, making mold mold no problem . Alibaba.com offers 16,187 ocean fishing products. About 22% of these are fishing lures, 3% are other fishing products, and 1% are fish. A wide variety of ocean fishing options are available to you, such as free samples, paid samples. There are 16,187 ocean fishing suppliers, mainly located in Asia. The top supplying country is China (Mainland), which supply 100% of ocean fishing respectively. Ocean fishing products are most popular in North America, Western Europe, and Eastern Europe. You can ensure product safety by selecting from certified suppliers, including 950 with ISO9001, 435 with Other, and 70 with ISO14001 certification.